Guests who wish to leave and reenter Whitewater Junction will need to get their hand stamped at the front counter. Any guest under the age of nine must be accompanied by an adult or guardian. The adult or guardian must be 16 years or older. Coolers or outside food and beverage are not permitted into the facility. Any child under three must wear a swim diaper. Swim diapers are available for purchase at Whitewater Junction. Youth groups must be affiliated with an organization and have at least 30 people. One counselor to eight children is required. Groups must give two weeks notice prior to visitation. Whitewater Junction reserves the right to limit the number of groups based on safety and security requirements. Rate is $6 per person. Whitewater Junction will not open if the air temperature is below 65 degrees. If Whitewater Junction closes due to weather for the remainder of the day, 2-for-1 swim passes will be issued. Must be 48" tall to ride the body slide or tube slide. Children between 36" and 48" may ride but must wear a life jacket provided by Whitewater Junction only. 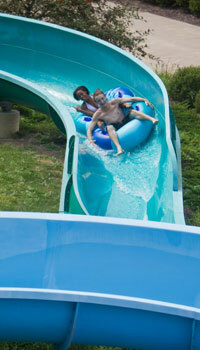 The drop slides have no height requirement but require passage of a deep-end swim test.